A Congress lawmaker has ended up in hospital after a brawl with a party colleague last evening at a resort, where they were moved on Friday. Anand Singh was hospitalised after he was hit on the head with a bottle by JN Ganesh at Bengaluru's Eagleton resort, the local media reported. While the Congress denied the reports, several of its leaders were spotted making a beeline for the hospital this morning. Congress leader Raghunath, who visited Apollo hospital, said they were not being allowed inside. Senior leader DK Shivakumar brushed away the reports of the fight. But his brother and party legislator DK Suresh is also at the hospital. Congress MLA's in Eagleton resort indulged in physical fight & 1 MLA is admitted. How long will congress be in denial mode & blame BJP for all their differences? Another tweet read: "It's unfortunate that @KPCCPresident was unable to stop the fight in Eagleton resort. We hope Anand Singh is being treated & we pray for his speedy recovery. Unfortunately @dineshgrao can't even blame BJP now, MLA's were locked up under his watch at Eagleton. Whats ur excuse now?" Earlier today, asked about the reports of the fight, Mr Shivakumar - who has emerged as the party's trouble shooter in the state, said: "It is impossible, you saw all of them coming and going together. It is all fake news, nothing is true. Everyone is together, the entire Congress party is united". When askied about the whereabouts of the two lawmakers, Mr Shivakumar said, "They are in the rooms... they will come and meet all of you". On Friday, the Congress moved 76 of its 80 lawmakers to the resort amid fears of poaching by the BJP. Tension had been brewing since last weekend, when the party accused the BJP of launching "Operation Lotus' - a term coined in 2008 when the party allegedly engineered defections of opposition legislators to ensure that its government headed by Mr Yeddyurappa remains stable. There were allegations that five lawmakers had gone out of touch - but two of the 'missing' men surfaced shortly, denying they had anything to do with the BJP. 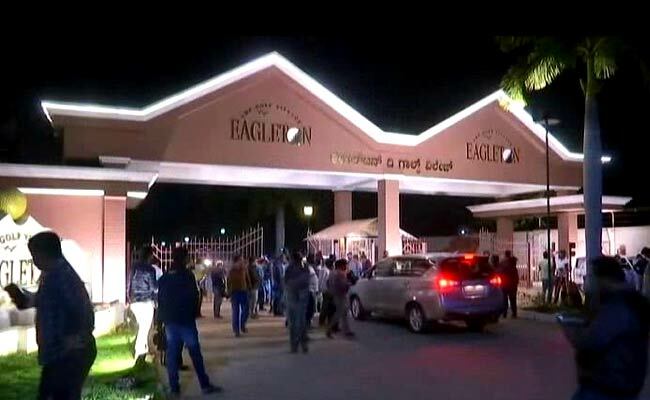 Four of the Congress lawmakers who have not made it to the Eagleton Resorts and failed to turn up for the Legislature Party meet on Friday have been sent a showcause notice. Mr Shivakumar said those who did not attend the meeting "will also come back strongly to the Congress fold". Chief Minister HD Kumaraswamy, who rules the state along with the Congress, has claimed the government is safe.